Sometimes it’s fun to make extravagant, complex dishes that involve lots of steps, lots of preparation, and lots of fun and flair. Today was not one of those days. Does that mean dinner should be any less yummy? I should say not! This recipe is a great way to do something simple and easy. It took me about 25 minutes from start to finish to make these zucchini. Great to serve up alongside some chicken breasts or pork chops, or even a pasta dish. Preheat oven to 425 degrees. 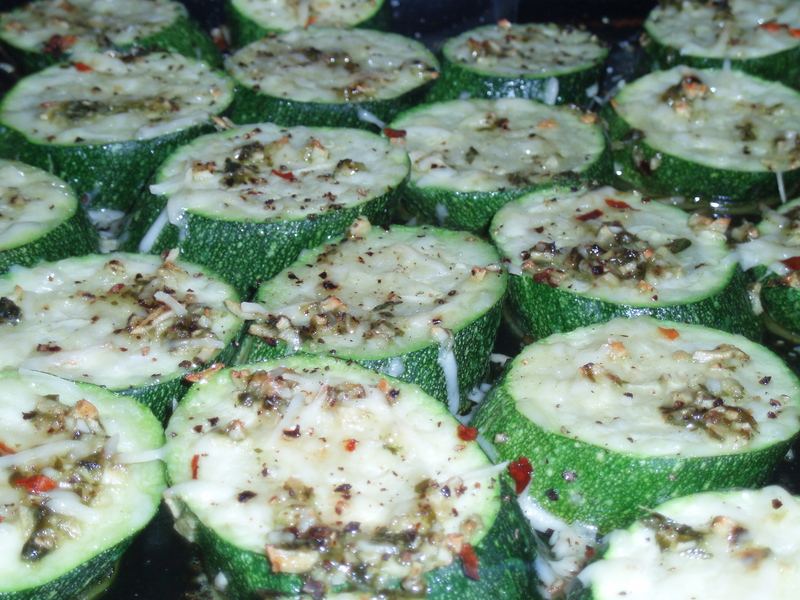 Place slices of zucchini in a single layer on a baking sheet or a 13X9 baking dish. Brush slices with olive oil. Spread garlic and basil over the zucchini, making sure you cover each slice. Season the slices with salt, pepper, and dried chile flakes. Sprinkle parmesan over slices. Bake in the oven for 15 minutes or until slices can be pierced easily with a fork, but are not mushy. Turn the broiler on high, and let the slices broil for a few minutes, until the cheese just begins to brown. Here I am again, experimenting with asian food. This is not an authentic Thai recipe, but the flavors used are common in a lot of Thai cooking. Don’t be overwhelmed by the long list of ingredients, once you get started, everything cooks fairly quickly. Once served, Sriracha (an asian hot chili sauce) is a great condiment if you like extra heat. In a small saucepan, heat broth, cilantro stems, garlic, ginger, and star anise to boil, reduce to simmer. Let simmer 15-20 minutes, and strain using a fine-meshed sieve. Keep warm. Heat water and salt in a medium saucepan to boiling, add rice. Stir, reduce heat to low and cover, cook for 15 minutes. Mix thai red curry paste with chicken, set aside. Heat a large skillet or wok to medium high heat. Add peanut oil, heat until shimmering. Add shallot, garlic, ginger, and thai chiles to skillet, cook for 2-3 minutes or until beginning to color and soften. Add chicken, and cook until chicken is just opaque, 3-4 minutes more. Add mushrooms and bok choy, stir to ensure even cooking. Cook for 3-4 minutes or until vegetables begin to soften. In a small bowl, whisk 1 c chicken broth with cornstarch. Add chicken broth mixture, soy sauce, fish sauce, and brown sugar to skillet and stir. Turn temperature to low, and cook for 1-2 minutes or until sauce begins to thicken. Adjust seasonings to taste, adding chicken broth if sauce is too thick. Squeeze lime juice into sauce. Serve rice with stir-fry, and sprinkle cilantro and basil on top. Everyone should have an easy-to-make, low-cost meal in their back pocket. This recipe is simply that. Its total comfort food for me (aka high in carbs). It’s easy to make (my 13-year-old stepson helped! ), and a kid favorite (that same 13-year-old ate two huge platefuls!). I also used it as a spaghetti sauce the other day, so it’s versatile. Substitute the ground turkey for ground beef if you’d prefer. Heat a large pot of salted water to boil. Add pasta to the pot, leave uncovered, cooking as directed on package (usually 7-10 minutes). Drain pasta. Meanwhile, set a large skillet to medium heat. Add 1 T olive oil, heat until shimmering. Add onions, cook 4-5 minutes or until translucent. Add garlic, thyme, Italian seasoning, and red pepper flakes, cook until garlic is soft, 2-3 minutes more. Salt and pepper to taste. Set aside. Add 1 T olive oil to skillet. Heat for a minute, and add ground turkey. Salt and pepper to taste. Brown turkey, stirring to break it up. Once turkey is browned, add anchovy paste and Worcestershire sauce, stir. Add cooked onion mixture, canned tomatoes and cans of tomato paste. Add chicken broth and stir to combine. Turn heat to medium-low and simmer 10 minutes. Add basil and stir. Adjust seasonings as necessary. Add pasta to sauce, stir to combine. Sprinkle parsley over top of pasta, if using. 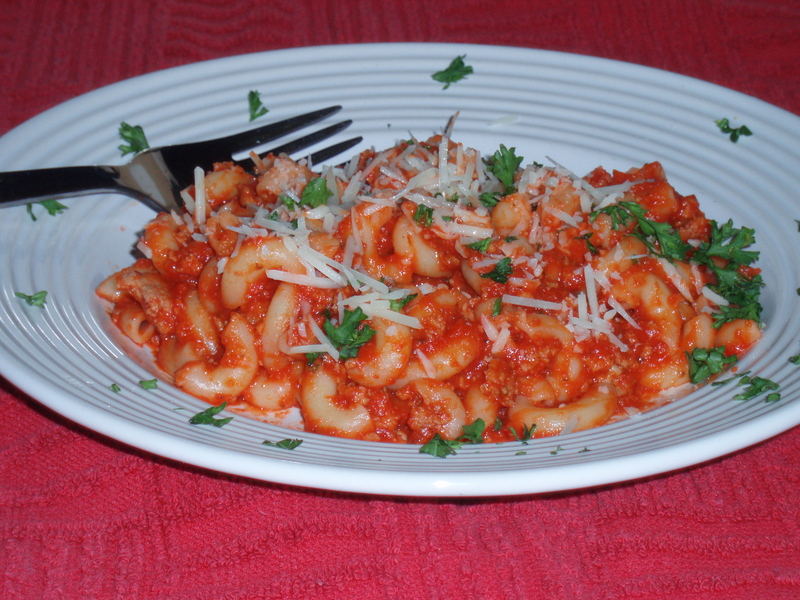 Serve with plenty of parmesan cheese and garlic bread. **note – You can also put the cooked onion mixture and the canned tomatoes in the food processor or blender and blend until smooth. My family prefers “unchunky” tomato sauce, so I tend to do it this way. Simply add this new tomato sauce at the same time as you would add the canned tomatoes. I dislike a lot of the boxed rice dishes they sell at the stores, most are loaded with salt. This is a tasty alternative, and is easy to make. This is wonderful with baked chicken. Heat saucepan to medium heat. Melt butter and olive oil in saucepan. Add carrot, cook until softened. (4-5 minutes) Add garlic powder and onion powder, stir. Add cream of chicken soup and half of chicken broth, stir. Turn heat to low. Add rice and stir. (Add more chicken broth as necessary to achieve smooth texture, you don’t want the rice to be dry or sticky.) Add parsley, and salt and pepper to taste. Cover, and warm rice through. Note: saffron water can be made by steeping a few threads of saffron in a few tablespoons of water. This leftover water can be frozen for future use, and will stretch the use of the saffron, which is quite expensive in stores. This recipe calls for the freshest of ingredients. If you have a farmer’s market in your area, I suggest visiting to pick up some wonderful fresh tomatoes and fresh basil. The tomatoes sold at the regular grocery stores are tasteless in comparison. There is nothing more wonderful than the simple combination of tomato, basil, and mozzarella, and this simple salad combines those beautiful flavors and presents beautifully. Excellent as a first course for a summery Italian dinner. Slice tomatoes thickly, about ½ inch thick. Drain fresh mozzarella and slice into rounds. Wash and dry basil leaves gently so they don’t bruise. Alternating layers, arrange tomatoes, basil, and cheese on a plate. Place lemon juice and wine in a medium bowl. Slowly whisk in the olive oil. Season with salt and pepper to taste. Drizzle desired amount over tomatoes and cheese. Let sit for about 10 minutes before serving. Heat pan to medium high, add oil and butter. Once butter is melted and foaming, add onions. Cook until onions are beginning to become tender and translucent, about 3 minutes. Add garlic, and squash. Season squash with lemon pepper. Sauté until squash can be pierced with a fork, 5-6 minutes. (don’t overcook, or squash will become mushy) Add parsley, basil, and spinach, if using. Sauté until spinach wilts, about a minute. Squeeze lemon juice over squash, and sprinkle Parmesan over. Season to taste with salt and pepper. A wonderful, fresh, summery dish, and very easy to make. I’m relatively new to fennel, but this recipe definitely highlights the wonderful, licorice-y flavor and compliments it well with the citrus. This would be a great choice to accompany a fish or chicken dish. Whisk together the olive oil, orange juice, cumin, onion powder, and season. Mix together salad ingredients, toss with dressing, and serve.